So that's my reading progress so far. It's moving right along and I think I might actually complete my goals! For the TBR Pile Reading Challenge, there are also monthly mini-challenges. 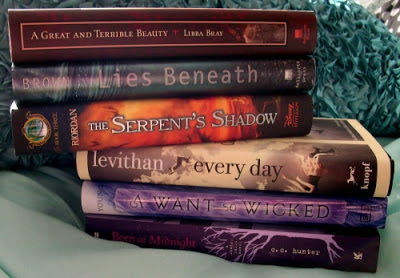 This month's challenge was to make a book spine poem. I'm total crap at poetry - and I've never done this before - but it was really kind of fun to see what my books could say. Here's mine! That really was a lot of fun! I can't wait to see what our mini-challenge is for February! I suppose I could share what I plan on reading, but I'm really kind of a mood reader. I know I'll be finishing up The Mark of Athena and then I'll be reading Scarlet with one of my blogging buddies, Jen of Literally Jen. After that, who knows! I have plenty of books to choose from, that's for sure!